Buying ATV Wheels - 12 or 14 Rims? Home > 12 or 14 inch Wheels? 12 or 14 Inch ATV / UTV Wheels, what's the difference? What's the difference between 12 and 14 inch wheels? Is there an advantage of using one over the other? 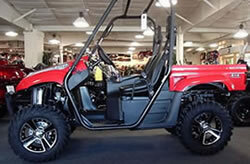 These are some of the most frequently asked questions our customers have when purchasing a new set of ATV rims. We've decided to write a brief explanation about the two and post pictures so you can feel better about making your purchase. As you can see from the sample pictures above, the main difference between the two types of wheels is obviously the size. 12 inch rims are 12 inches in diameter. 14 inch rims are 14 inches in diameter. The 12 inch is the more common traditional look that you've seen on ATV's for many years. The 14 inch are more hip, more fancy, more bling bling. 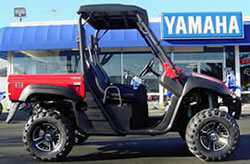 They stand out a little more and give your ATV/UTV a flashy appearance. Aside from the looks check out some pros and cons we've compiled. - many are available in 2 widths. 6 or 7 inch wide fronts and 8 inch wide rears. When it all boils down to it the two most important things to consider when making a purchase are: 1st - What can you afford? 2nd -Which looks better in your opinion?